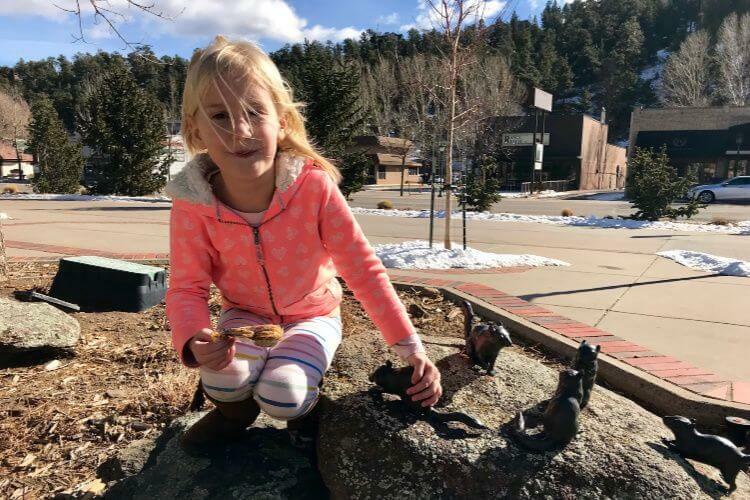 Kids Are A Trip contributor Heidi Gollub recently took her six-year-old daughter for a snow-filled birthday adventure in Estes Park, Colorado. 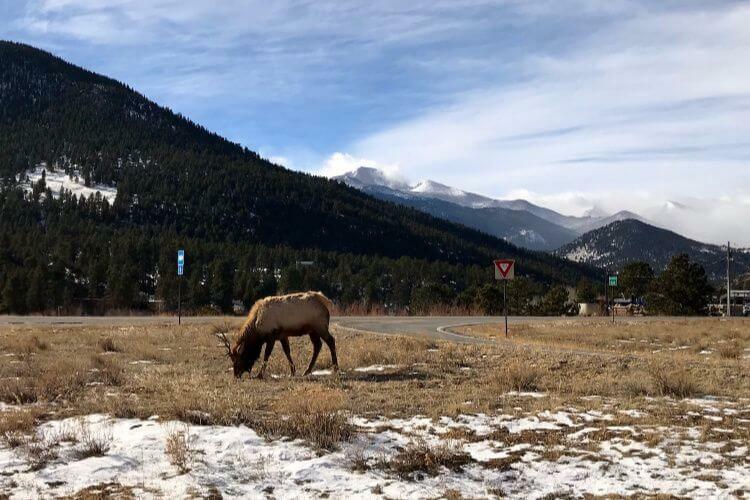 Located only 90 minutes from Denver International Airport, Estes Park is a perfect spot to enjoy winter activities like snow shoeing, horseback riding, and sledding. 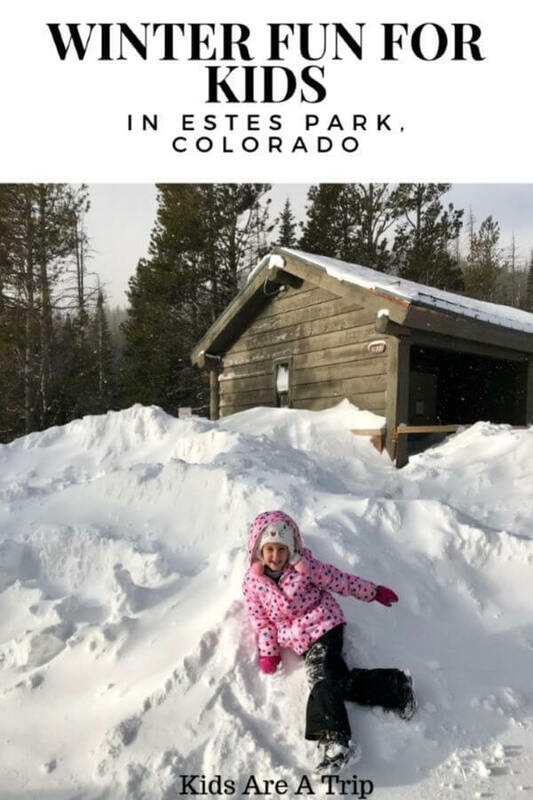 The Texan mother-daughter duo crammed a winter’s worth of outdoor fun into one chilly weekend, with the Rocky Mountains as their backdrop. Last year, for my daughter’s golden birthday, we planned a special trip from Austin to Orlando, to visit Walt Disney World Magic Kingdom in one day. We both loved that whirlwind birthday adventure so much, we decided to try another trip-instead-of-a-party this year, to celebrate her sixth birthday. One airfare sale later and we were packing our winter gear, excited to explore Estes Park, Colorado, Gateway to the Rockies. On a Saturday morning in late January, my daughter and I boarded an early morning flight in Austin and landed in Denver at sunrise. After renting a car with 4WD, we set off on the scenic 76-mile drive from Denver to Estes Park. By 10 a.m., we were at Sombrero Stables, bundled up and ready for horseback riding in the mountains. 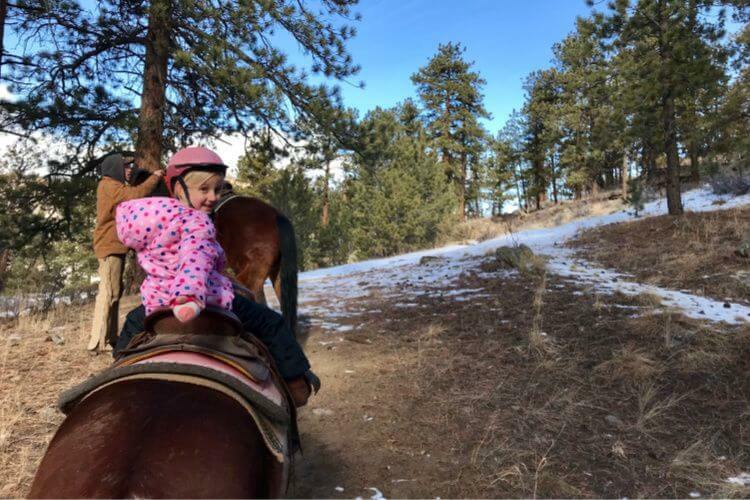 My daughter’s dream for this trip was to enjoy a trail ride on her own horse. Not a pony, not a horse being led by a rope, and not having to share a saddle with an adult. 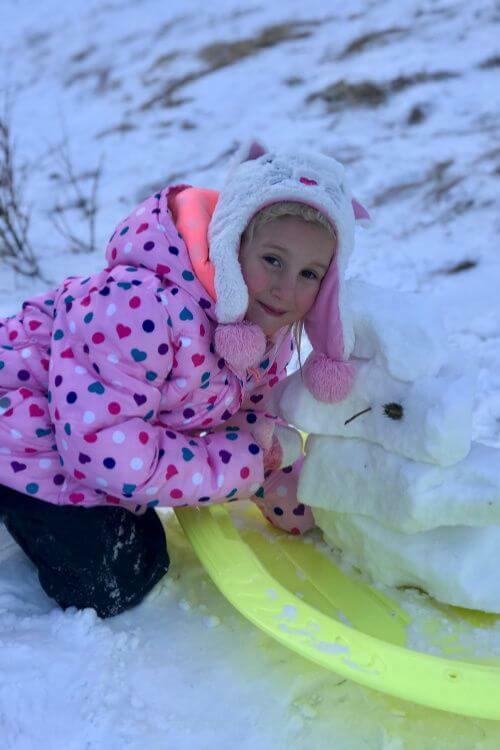 Her own giant horse. Her wish came true at Sombrero Stables, where kids can ride alone once they reach the magical age of six. (Phew!) What a birthday gift. She was thrilled. I opted for the one-hour trail ride, which was a great deal, thanks to Groupon. The stable wasn’t busy that early in the day, so we also scored our own private guided ride. For an hour, we bounced idly along on horses named Pinecone and Sunny, traversing a gorgeous private ranch and meeting deer along the way. Our young guide was full of stories and was happy to tell us about the history of the ranch, the animals he sometimes encounters there, and his love of Colorado. It was the perfect way to start our first day. After hearing tales of the 63 species of animals we might spot in Estes Park, we were excited as we headed into town. And, sure enough, we found herds of elk and mule deer. Just strolling on the streets and holding up traffic. There weren’t a ton of tourists in January, and winter months are apparently especially good for wildlife spotting. After checking into our hotel, we went to Poppy’s Pizza & Grill for lunch. Across the street from the restaurant, we noticed a sculpture of cute bronze pikas, which set us off an impromptu hunt for more. There are 12 bronze pikas scattered throughout the village. You can try to find them on your own or download an activity guide to help with the Pikas in the Park scavenger hunt. Once you’ve found all 12, head over to the Estes Park Visitor Center to claim your Pika Finder Button. Feeling full and happy, we hopped back in the car to explore beyond the bounds of Estes Park. Using a list of recommended winter scenic drives and a Rocky Mountain National Park map, we struck out for Rocky Mountain National Park. I was relieved to discover that there wasn’t much snow or ice on the roads so driving in winter wasn’t as challenging as I’d feared. I was glad, however, to have 4WD for the mountains. The entrance to Rocky Mountain National Park is a mere five minutes from Estes Park. We paid $25 for a day pass (it would have been free if we’d had a fourth grader with an Every Kid in a Park pass), and were immediately greeted by a herd of bighorn sheep. We passed the Beaver Meadows Visitor Center and went straight to Hidden Valley’s sledding and tubing area. Hidden Valley used to be a family downhill ski area, but now you can hike up the hill and fly down on your sled. It’s a beautiful spot, with stunning views of the mountains beyond. And, it’s a great place to go with kids because the sledding hill is right next to the parking lot, and there are flushing toilets nearby. It was snowing while we were there, so it felt like a magical winter wonderland. We sledded, and made snow angels and mini snowmen, until we were completely worn out. Then, it was time to head back into town for dinner at Antonio’s Real New York Pizza, followed by s’mores at the hotel. The next day started with breakfast and a quick swim in the hotel pool. Then, we borrowed snowshoes and headed back to Rocky Mountain National Park. I should have originally purchased a seven-day pass for the park, but I showed our receipt from the previous day and a kind ranger upgraded our pass for just $10. Feeling delighted to have saved $15, we drove on to Bear Lake. The drive along the scenic Bear Lake Road was slightly slippery, with fresh snow falling, but snow plows were hard at work clearing the roads. We arrived at the trailhead in one piece, just as the parking lot was starting to fill up. We put on our waterproof pants, boots and snowshoes and set out towards the frozen lake. The loop around Bear Lake was only a half mile, which was nice to discover. We had never tried snowshoeing before and didn’t have poles, but we fared just fine. 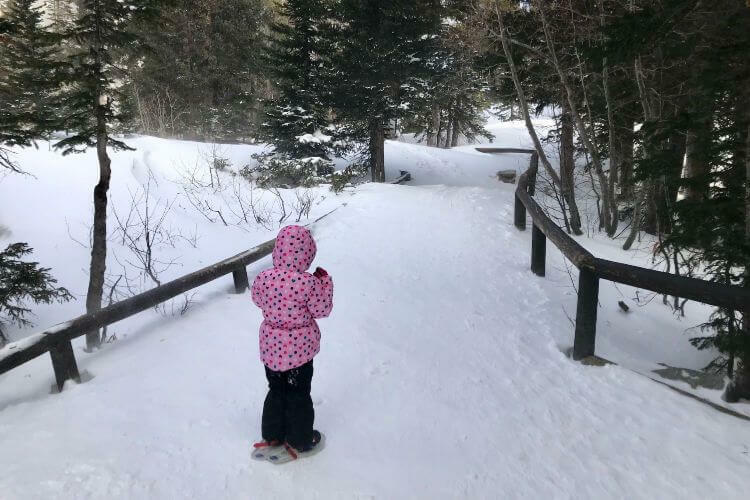 I had considered trying a free ranger-led snowshoeing program, or a $10 family trek offered by Rocky Mountain Conservancy, but for our first experience I was glad to take it at our own pace. It was easier than expected and I will definitely try it again. As we left Bear Lake, I noticed that traffic headed towards the trailhead was really backing up. So, this is a great hike to do first thing in the morning! Beat the rush by arriving before the crowds. Following our snowshoeing trek, it was already time to check out of the hotel and head back to Denver. It was definitely a quick jaunt to Estes Park, but boy was it fun! And our stay was made even better by the Appenzell Inn. Our room at Appenzell Inn was $105. For this price we enjoyed free snacks, free movies, free games, free s’mores, free hot beverages, free popcorn, free breakfast, an indoor pool, an outdoor hot tub, free sled rental, and free snowshoe rental. What a deal! It was definitely the little inn that could. I’d recommend it to anyone looking for a cozy, convenient Estes Park hotel. 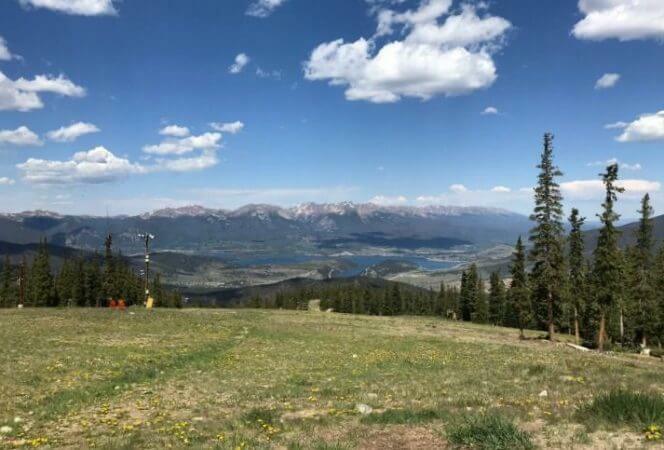 If you’re looking for a hotel near Denver International Airport, we loved the brand new Gaylord Rockies Resort and Conference Center. My daughter had a blast at the huge indoor water park and I enjoyed the breathtaking view of the Rockies. It was a great way to close out our weekend of Colorado fun. For a more affordable option, though, I’d recommend booking this family friendly home in Denver for just $184 per night. It’s also convenient to the airport and only five miles from downtown Denver. The house comfortably sleeps six, so it’s a great choice for families. Wherever you stay, know that you can have an incredible winter adventure in Colorado without spending a ton of time or money. Just book a cheap flight, or plan to drive, and go! 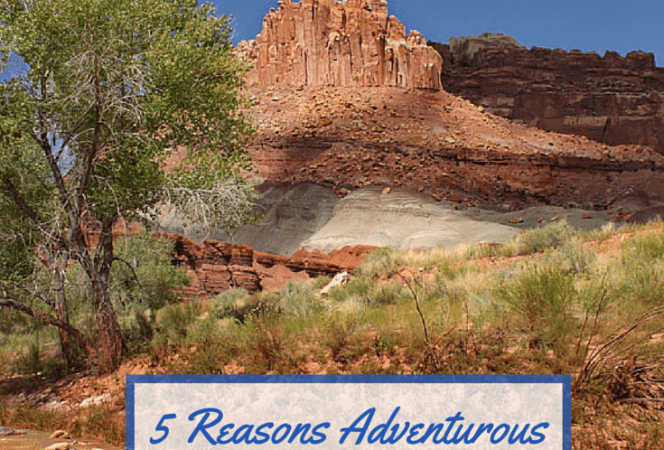 Looking for more Colorado trips? 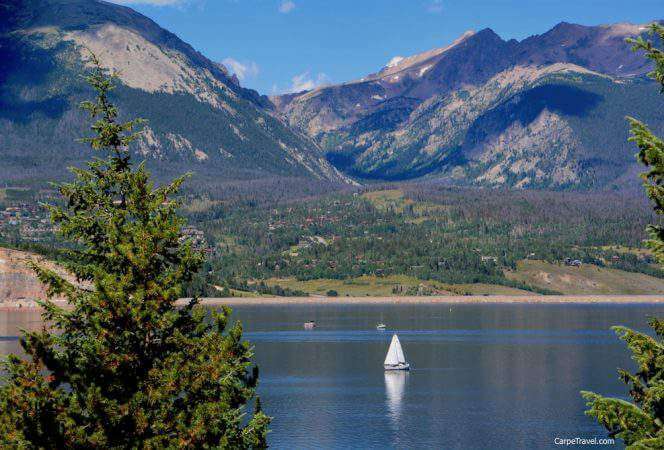 Check out our Denver post, Keystone post, or Dude Ranch post and start planning!